Equipping your home kitchen doesn't require hundreds of dollars or Swedish ceramics. 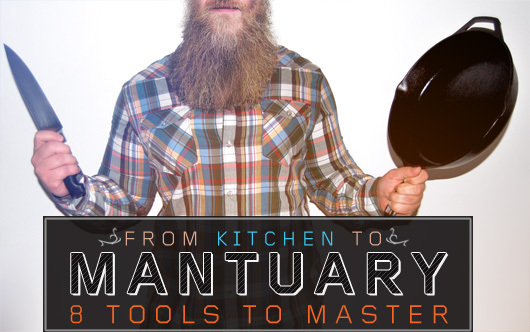 Arm yourself with these eight essential, and manly, culinary tools and you'll have all you need to dominate your kitchen right at your fingertips. Mastering the art of food is about resourcefulness and creativity. Hunting and gathering are no longer about men and food; those terms now only apply to survival in general, whatever the scenario. Leave behind the bachelor on the frozen pizza and ramen diet. Equip your passion to live well– combine knowledge with tools and make a lot, using very little. There are a lot of contraptions out there designed for specific tasks but countless meals can be created with a handful of quality essentials — 8 to be exact. In many ways the knife is an extension of the arm, choose carefully. There are dozens of knife varieties out there but if a good meal is like a battle, a good chef’s knife is your greatest ally. It’s worth spending some money on because a good knife will last you a life time. Balance is key–it should rest across your fingers and feel as natural in your hand as shoes do on your feet. The knife you want will have a 6-10 inch triangular blade that has a significantly thicker spine (blunt side of the blade) than the cutting edge. A slightly curved cutting edge enables a rocking motion when chopping; though some prefer a straighter edge. Look for thicker, heavier blades that do not bend easily; push your thumb against the edge to test it. Forged knives are made from a single chunk of material. Generally, they are more balanced than blocked (stamped out of a roll of sheet metal) knives. Quality wise, a forged knife is to a stamped one as a fresh ground burger is to a frozen patty. A forged knife is thicker where the blade meets the handle; this section of the blade is called the bolster and also shows how thick the original metal was. The best forged knives are single pieces of metal that length-wise run from the tip of the blade to the back of end of the handle. We reviewed a set by J.A. Henckels, they’ve done us right so far. There are many places to shop for knives, I recommend finding one in a kitchen store near you that feels right. Once you find one you like you can probably find the exact model for cheaper online. Here is a good site to get an idea of styles and price ranges. Honing, not to be confused with sharpening, is crucial to the proper upkeep of your chef’s knife. A knife that slices easily through tomato skin and meat can be incredibly satisfying but few things are as frustrating as a knife that just makes lines on whatever you’re trying to cut. Honing realigns and straightens microscopic ‘teeth’ along the blade’s edge that become jagged with normal use. A honing steel should be at least as long as your knife, a few inches longer is even better. Think of what combing wet hair looks like; honing the blade will comb the fibers over on both sides. Honing will not save a dull blade; it is intended to maintain the edge of an already sharpened blade. Your knife should be honed regularly, like once a week, to maintain a keen edge; you most likely won’t need to sharpen your knife more than once a year. Look for a regular honing steel, as opposed to diamond steel or ceramic. These are cheaper, not as abrasive on the knife’s edge. I wouldn’t upgrade to diamond steel or a ceramic rod until you’re sure you know what you’re doing. Wood represents earth, earth represents strength and this is an important element to have in your kitchen if it’s going to be a mantuary. 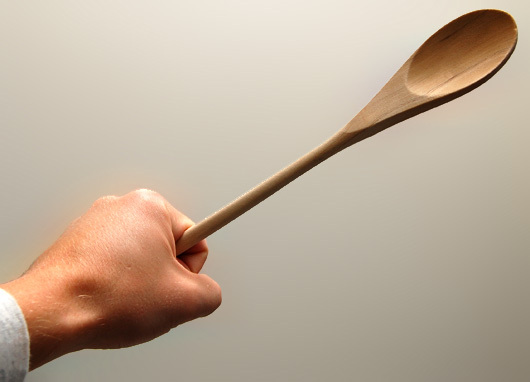 Wooden boards are easier on your knife’s edge than plastic or glass. At one point in time it was thought that wooden boards harbored more bacteria than plastic or glass but studies have since proven the opposite to be true—when wood absorbs moisture it is harder for bacteria to survive. Take care of it and it will last as long as your knife. Don’t toss one of these in the dishwasher, always hand wash it and every now and then rub some food-grade (mineral oil usually) oil into the top surface to help seal the pores and preserve the seal and appearance of the board. The cast iron skillet captures the very essence of man–they are inexpensive, practical, durable, versatile and they demand respect. Iron skillets are excellent conductors of heat and they heat evenly through. Iron withstands higher temperatures than the alternatives—you can take something from the stove top and throw it in the oven. Many skillets come pre-seasoned; meaning a natural non-stick coating has been cooked in. This surface will last a long time and requires little, if any, oil when cooking. Seasoning, or curing, your skillet seems intimidating at first but it is quite simple and is more than worth the trouble. Depending on the dimensions of the skillet it can be used for cooking meat, eggs, making pancakes, creating sauces, frying things and even baking. 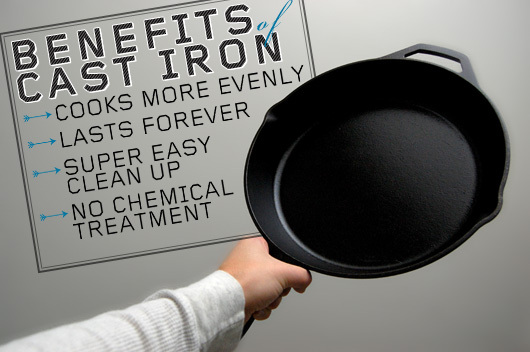 Learn more about cast iron skillets on Primer with Cast Iron Man Cooking. 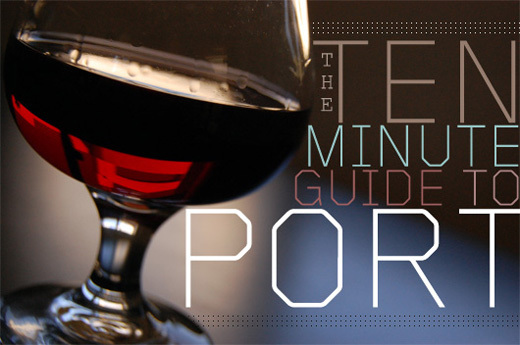 Even purists will at some point use something out of a can. Canned, whole ingredients are often a way to make something from scratch without needing entirely fresh ingredients—using plain tomato sauce from a can to build a marinara, for example. The main ingredient of most man meals is born from a big pot with handles and a lid and it usually involves boiling something. A Dutch oven gets the job done just as well—get a cast iron one and you can do your baking in it and take it camping. Use it to cook a huge batch of fried rice with eggs and vegetables, pasta for a killer Alfredo that will leave leftovers for a week or mashed potatoes to throw behind any meat or vegetable you slay on the iron skillet. 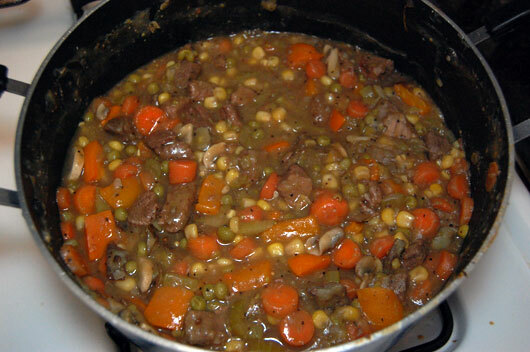 Try making our Man Made Meal: Harvest Stew. It’s delicious and will feed you for a long time. Slotted spoon, tasting spoon, spatula and tongs. Stir, flip, taste or serve; you have what you need to master any meal. You can leave the wooden spatula resting on the edges of the iron skillet while the food cooks; it will not conduct heat and will not melt onto the sides. This set will give you an idea of what to look for, there are many variations. Whether it’s measuring out water for mac and cheese or trying to get rice right; certainty can separate success from disaster. When following recipes the same measuring cup can be used to accurately portion out each ingredient. There are other tools that make specific tasks more convenient but you can pull off any feast with a primitive set up. A rustic approach to food means ingenuity, pride in working with your hands and the comfort in knowing you don’t resemble anyone who accessorizes. When a kitchen is also a mantuary it becomes a catalyst for stimulating ideas and that’s one step closer to living well. Jonathan Froehlich is the full-time, private chef for his son and writes for both work and recreation. His passion for food and revelry blend nicely into a career in the Finger Lakes (NY) wine and food industry. I’d recommend considering a cast iron grill pan (CIGP) to make the perfect steaks. No need to lose previous fat over a grill when you can use a CIGP to sear a steak on the stove top and finish it in the oven with a bit of clarified butter. Every guy has had one. The one girl pivotal in shaping what you are, and probably most importantly, what you're not.